It’s a new era and the Village of Canal Flats, a small community located on the scenic southern shore of Columbia Lake in the East Kootenay, is ready to embrace the possibilities with a new technology centre. Taking over the site that, for the many years previous was home to the mill and the village’s primary employer, the new Columbia Lake Technology Centre wants to bring data centres, greenhouses, trades training, technology training and more to the town and the region. A reception area at the mill site was packed with a standing-room-only crowd, including Premier John Horgan and Canal Flats Mayor Ute Juras, on Tuesday, June 12th as the co-founders of the Columbia Lake Technology Centre announced their plans to turn the location into a high-tech data hub and training centre. “We’re pulling from the past to the future,” centre co-founder Brian Fry said. Fry, successful Technology Entrepreneur and Sr. Executive with 30 years of industry experience as well as co-founder of i4C Innovation Hub, in Trail, envisions seeing data centres, greenhouses to take advantage of the heat produced by the centres, training facilities, technical training programs and more. The location also comes with the advantages of being near “the glorious mountains,” and having access to affordable housing and land to develop, he said. The mill shut down in 2015 and last year Mr. Fry’s co-founder, Brian Fehr, purchased the land. Mr. Fehr chairs BID Group, a multinational corporation. His work has taken him all over rural BC and around the United States with high-tech equipment that makes manufacturing more efficient. Fry adds that the availability of power and high speed fibre Internet in the area is extremely important. Premier John Horgan, a former mill worker himself, stopped in Canal Flats to cheer on the initiative. The forestry industry continues to thrive, he said, but technology is displacing workers. It only makes sense that the tech industry should play a big role in filling that gap in those areas and communities, like Canal Flats, that have found themselves so affected. Over 20 people are already employed at the Columbia Lake Technology Centre site. By the end of the year, Mr. Fehr expects to have 100 people working on location – just as many as had been employed at the mill. 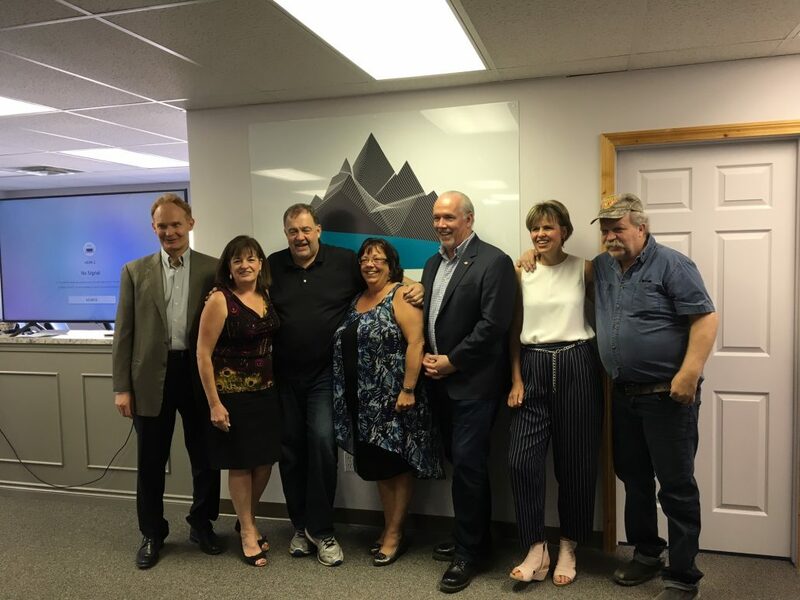 “The Columbia Lake Technology Centre is a classic example of how you can take industrial space, you can take access to energy – which the Kootenay has in abundance – and create economic opportunity” said Premier Horgan. “What we’re experiencing right here, taking what was a crisis in 2015, and turning it into an extraordinary opportunity just three years later – because of the work of the community, because of the Trust, because of investors that had a vision – it’s just inspiring,” he said. “When the mill closed, we were devastated,” said Canal Flats Mayor Ute Juras, admitting that the shutdown brought the community to tears.